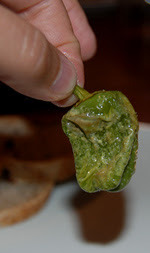 My next-door neighbor, Dale (he and his wife own the quince tree), recently introduced me to Pimientos de Padrón, a traditional, yet surprisingly action-packed, Spanish tapa. When Dale was in college, he spent a semester in Spain. 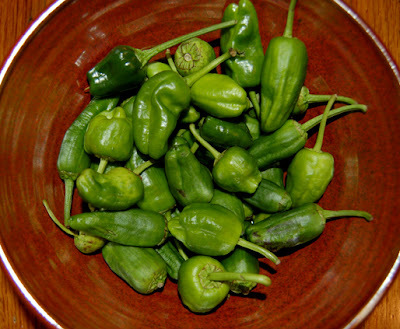 While he was there, he fell in love with Spanish cooking and got hooked on these little green peppers. What makes this tapa so special, you ask? For some reason, one out of every five or so of these mild, sweet peppers is blisteringly hot! So eating them is akin to playing a casual game of Russian Roulette over dinner and drinks. The sous-chef and I made them earlier tonight as an appetizer served with some kalamata olive bread to sop up the tasty, salty oil they were fried in (and some honey to take the edge off the heat when we ran into a spicebomb.) 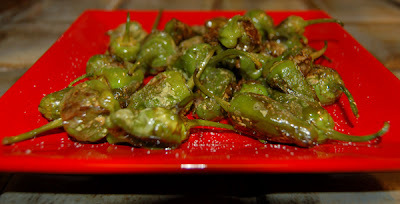 The non-spicy peppers have a mild, slightly nutty, slightly sweet flavor. The hot ones seemed to fall into two groups - tolerable and intolerable. All in all, they were quite good and lots of fun. The preparation is extremely simple - see below for Happy Quail Farm's recipe. 1. Take a pan and pour enough oil to generously cover the bottom of the frying pan. 2. Turn the heat up on the burner. When the olive oil starts to sizzle throw the peppers in whole. 3. When the peppers start having small white blisters they are ready. Take the peppers out of the pan, place on plate with a paper towel. 4. Sprinkle with coarse salt. Hold the pepper by the stem and bite! I had completely forgotten about those wonderful little devils. Thanks for bringing them back to my mind.. I love these and had never thought about how to cook them myself. Must try it one day. Love the photography on your blog by the way!